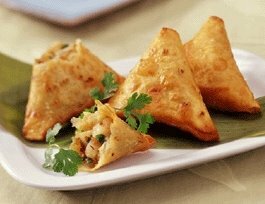 So, since forever, I've always hated foods with pastry - samosas included (also because they're usually too spicy for me), but last week we had some friends over (with their beautiful little girl) and we had loads of samosas to offer them. I was kind of peckish, so I thought 'what the hell' and had one. Oh my god, it was very good. Surprisingly, the pastry was the best part - I loved the edge bits where it was nice and crunchy. I hate when this happens. These look and sound so yummy! Do you have a recipe? Do they ever look yummy! I'm not a big fan of pastry foods but I do enjoy spanakopita . itybityfrog - no recipe, we buy them from a local shop.